The Fair happened on October 11th, 2017 and it was a success. We had at least 60 visitors – after that we lost count. We invited CDT cohorts as well as PhD students across the College to come, network and pick up useful tips. The event started on a high note, almost everyone showed up right when the door opened. The visitors dispersed around the exhibits and listened to what we had to say. The ones that needed a bit of help with getting enthusiastic got cookies coffee or tea. We had an incredibly busy three hours at the exhibits as well as giving short talks. After picking up useful computing tips and hints, the audience had a chance to visit a poster session at the Fair. We invited open source software projects from the College to present to the students. Many of these packages can be applied to various types of projects. Who knows, maybe we encouraged future collaborations. The pizza and beer arrived just in time, one could not keep this pace much longer. The networking part that followed went very smoothly. 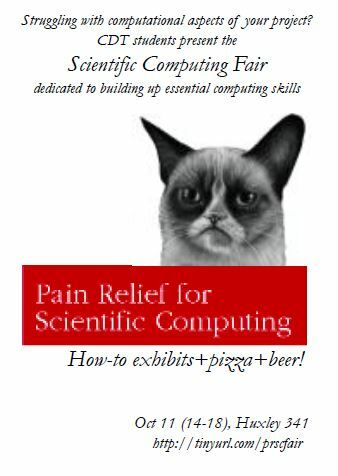 With the Fair out of the way, we intend to continue our effort to educate the cohorts via the Scientific Computing Support Network. There is a good chance that we’ll organise the Fair again. Note to self – keep it simple and order more pizza. Many thanks to the Graduate School, Platform for Research in Simulation Methods and the Research Computing Service for funding and many thanks to everyone who contributed to the poster session.